When is the last time you replaced your water heater? If you can’t remember, now might be a good time to check. Water heaters have a limited lifespan, and when they decide to stop working, it is usually a disaster. Technological improvements in recent years mean a significant energy savings for your utility bill with a newer model. Here’s a look at everything you need to know about replacing your water heater system. When installing a new water heater, you need to know how much hot water your household uses. A family of four uses a lot more hot water than one person living alone does. If your water heater is too big, it will be heating extra water for no reason, wasting energy. If you’re not heating enough, you may end up taking cold showers. Start logging how much hot water you and anyone else living in your house uses in a day. Then calculate how many gallons of water you might need. This tells you how much water to plan for in a single day. A professional plumber can determine your household’s water usage and which system is the best for your needs. A typical installation job takes two or three hours, depending on the complexity of the situation. Next, the plumber will put the water heater in the right position. The last step is to connect the new system to return things to working order. If you experience any of these symptoms, or if you are simply reaching the end of your water heater’s life, it is in your best interest to replace the unit before it breaks. 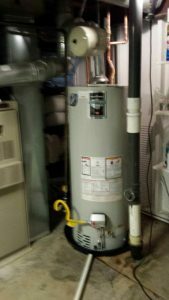 The experts at Efficient Plumbing Services in Littleton are ready to help with your water heater repair or replacement. We can help you determine which size water heater and which system is the best fit for your household needs. With over 18 years of Colorado plumbing experience, our family business is ready to take care of your needs. Request a free quote today and we can get started on your water heater replacement as soon as possible.